Henschel was one of four companies (the others being Focke-Wulf, Gotha and Hamburger Flugzeugbau) to which, in April 1937, the Technische Amt of the Reichsluftfahrtministerium (RLM) issued a specification for a twin-engine ground-attack aircraft. It was required to carry at least two 20 mm MG FP cannon and to have extensive armour plating protection for crew and engines. The two designs for which development contracts were awarded on 1 October 1937 were the Focke-Wulf Fw 189C and Henschel Hs 129. The latter was another Friedrich Nicolaus design with a light alloy stressed-skin fuselage of triangular section. It contained a small cockpit with a restricted view, necessitating the removal of some instruments to the inboard sides of the engine cowlings. The windscreen was made of 75 mm (2.95 in) armoured glass and the nose section was manufactured from armour plating. Nose armament comprised two 20 mm MG FF cannon and two 7.92 mm (0.31 in) MG 17 machine guns. The prototype flew in the spring of 1939, powered by two 465 hp (347 kW) Argus As 410A-1 engines, and two further prototypes were flown competitively against the modified Fw 189 development aircraft for the Fw 189C. Although the Henschel aircraft was considered to be underpowered and sluggish, and to have too small a cockpit, the company was awarded a contract for eight pre-production Hs 129A-0 aircraft, and these were issued initially to 5 (Schlacht)./LG 2 in 1940, but transferred to 4./SG 101 at Paris-Orly in 1941, with the exception of two which were converted at Schonefeld to accept Gnome-Rhone 14M 4/5 radial engines. It was with this powerplant that 10 Hs 129B-0 development aircraft were delivered from December 1941; improvements included a revised cockpit canopy and the introduction of electrically-actuated trim tabs, and armament comprised two 20 mm MG 151/20 cannon and two 7.92 mm (0.31 in) MG 17 machine guns. The production Hs 192B-1 series went into service first with 4./SchG 1 at Lippstadt in April 1942 and also became operational on the Eastern front, where the type was to be used most widely, although it served also in North North Africa, Italy and in France after the D-Day landings. Sub-variants of the M 129B-1 series included the Hs 129B-1/R1 with additional offensive armament in the form of two 110 lbs (50 kg) bombs or 96 anti-personnel bombs; the Hs 129B-1/R2 with a 30-mm MK 101 cannon beneath the fuselage; the Hs 129B-1/R3 with four extra MG 17 machine-guns; the Hs 129B-1/R4 with an ability to carry one 551 lbs (250 kg) bomb instead of the Hs 129B-1/R1's bombload; and the Hs 129B-1/R5 which incorporated an Rb 50/30 camera installation for reconnaissance duties. By the end of 1942 the growing capability of Soviet tank battalions made it essential to develop a version of the Hs 129 with greater fire-power, leading to the Hs 129B-2 series which was introduced into service in the early part of 1943. 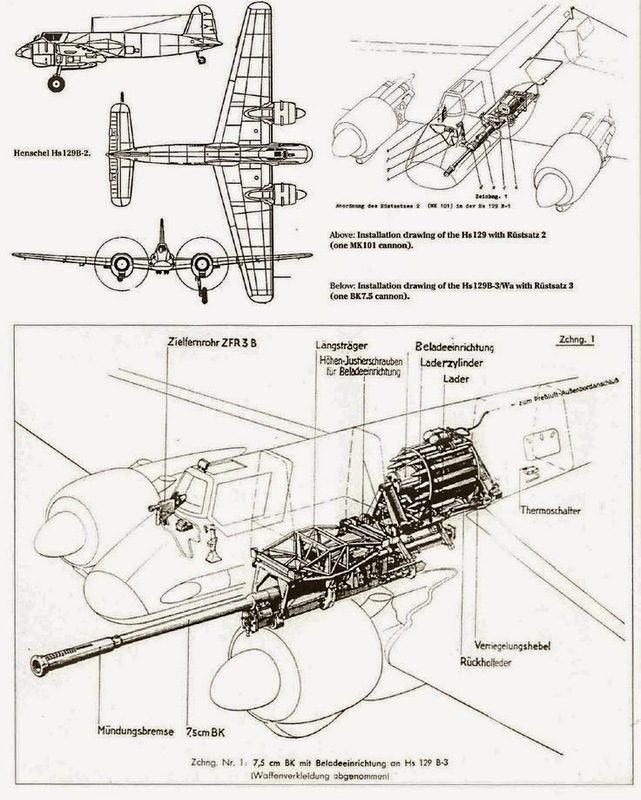 They included the Hs 129B-2/Rl which carried two 20 mm MG 151/20 cannon and two 13 mm (0.51 in) machine-guns; the generally similar Hs 129B-2/R2 introduced an additional 30 mm MK 103 cannon beneath the fuselage; the Hs 129B-2/R3 had the two MG 13s deleted but was equipped with a 37 mm BK 3,7 gun; and the Hs 129B-2/R4 carried a 75 mm (2.95 in) PaK 40L ('L' for Luftwaffe) gun in an underfuselage pod. Final production variant was the Hs 129B-3 of which approximately 25 were built and which, developed from the Hs 129B-2/R4, substituted an electro-pneumatically operated 75 mm BK 7,5 gun for the PaK 40 (Panzer Abwehr Kanone 40). The lethal capability of the Hs 129B-2/R2 was amply demonstrated in the summer of 1943 during Operation 'Citadel', the German offensive which was intended to regain for them the initiative on the Eastern Front after the defeat at Stalingrad. During this operation some 37,421 sorties were flown, at the end of which the Luftwaffe claimed the destruction of 1,100 tanks. However accurate these figures, not all of those destroyed could be credited to Hs 129s, but there is little doubt that the 879 of these aircraft that were built (including prototypes) played a significant role on the Eastern front. In spite of its small numbers and deficiencies, proved extremely successful in the anti-role, however, it suffered heavy losses and not many examples survived the war. The Hs 129B equipped three Staffeln of the 8th Assault Wing of the Royal Romanian Air Corps. On 23 August 1944 there was a coup in Romania, as a result of which the country changed from being an ally of Germany to becoming an enemy. 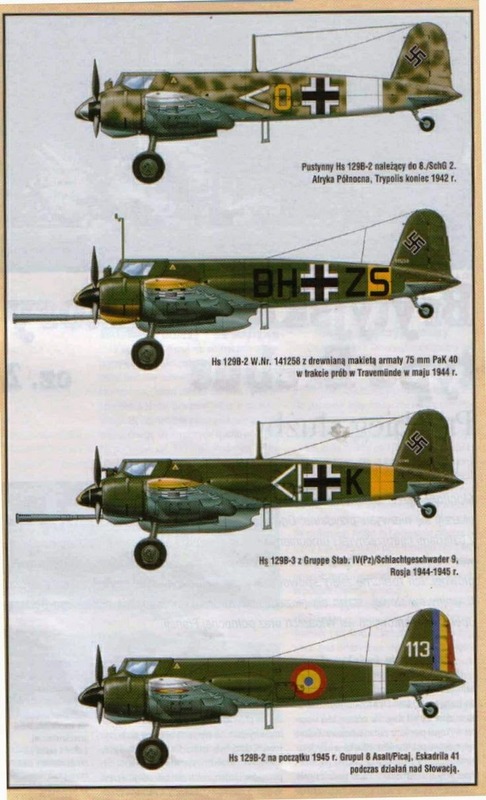 These Hs 129Bs, accordingly were used against the German armies, finally being combined into a unit equipped with the Ju 87D Stuka. In late September 1944, the entire manufacturing programme was abandoned, along with virtually all other German aircraft production except the 'emergency fighter programme'. Total production had amounted to only 879, including prototypes. Because of attrition and other problems, the Hs 129 was never able to fully equip the giant anti-tank force that could be seen to be needed as early as winter 1941-42, an overall effect on the war was not great. Towards the end, in autumn 1944, operations began to be further restricted by shortage of high octane petrol, and by the final collapse of Germany only a handful of these aircraft remained. Because of the triangular-section fuselage and the need to keep the airframe as small as possible the cockpit of the Hs 129 was very cramped. So cramped in fact that the Revi C 12/C gunset was mounted on the aircraft nose outside of the cockpit and certain engine instruments were mounted on the inboard side of the engine nacelles for the pilot to view. The entire nose section formed a welded armoured shell 6 mm to 12 mm thick around the pilot, with toughened 75 mm thick glass in the canopy. The total weight of the nose armour was 2,380 lbs (1080 kg). A large pilot would have a great deal of trouble in handing the aircraft in ground attacks and a short control stick required a great deal of strength to move even in the modest manoeuvres. The massive build-up in Soviet armour strength with thick-skinned tanks contrasted with the faltering strength of the Sch.G. units, which continued to be afflicted by poor engine reliability despite the addition of properly designed air filters. The overriding need was for more powerful anti-armour weapons, and on 10 January 1944 a special unit, Erprobungskommando 26, was formed at Udetfeld out of previous Sch.G. units to centralise the desperate effort to devise new weapons and tactics. Its Hs 129s soon appeared with various new armament, some of which were too much for what was, after all, a small aircraft. The outstanding example of the new weapons was the radically different Forstersonde SG 113A. This comprised a giant tube resembling a ship's funnel in the centre fuselage just behind the fuselage tank. Inside this were fitted six smooth-bore tubes, each 1.6 m (5 ft 3 in) long and of 77 mm calibre. The tubes were arranged to fire down and slightly to the rear, and were triggered as a single group by a photocell sensitive to the passage of a tank close beneath. Inside each tube was a combined device consisting of a 45 mm armour piercing shell (with a small high-explosive charge) pointing downwards and a heavy steel cylinder of full calibre pointing upwards. Between the two was the propellant charge, with a weak tie-link down the centre to join the parts together. When the SG 113A was fired, the shells were driven down by their driving sabots at high velocity, while the steel slugs were fired out of the top of each tube to cancel the recoil. Unfortunately, trials at Tarnewitz Waffenprufplatz showed that the photocell system often failed to pick out correct targets. Another impressive weapon was the huge PaK 40 anti-tank gun of 75 mm calibre. This gun weighed 3,303 lbs (1500 kg) in its original ground-based form, and fired a 7 lbs (3.2 kg) tungsten-carbide cored projectile at 3,060 ft/sec (933 m/sec). Even at a range of 3,280 ft (1000 m), the shell could penetrate 5 1/4 inches (133 mm) of armour if it hit square-on. Modified as the PaK 40L, the gun had a much bigger muzzle brake to reduce recoil and electro-pneumatic operation to feed successive shells automatically. Installed in the Hs 129B-3/Wa, the giant gun was provided with 26 rounds which could be fired at the cyclic rate of 40 rounds per minute, so that three or four could be fired on a single pass. Almost always, a single good hit would destroy a tank, even from head-on. The main problem was that the PaK 40L was too powerful a gun for the aircraft. Quite apart from the severe muzzle blast and recoil, the sheer weight of the gun made the 129B-3/Wa almost unmanageable, and in an emergency the pilot could sever the gun's attachments and let it drop. Powerplant:(B-Series) Two 700 hp (522 kW) Gnome-Rhone 14M 4/5 14-cylinder radial piston engines rated at take-off. (A-Series) Two 465 hp (347 kW) Argus As 410A-1 air cooled inverted Vee 12-cylinder engines. Performance:Maximum speed 253 mph (407 km/h) at 12,565 ft (3830 m); service ceiling 29,525 ft (9000 m); initial climb rate of 1,600 ft (486 m) per minute. Range:(Hs 129B-2) 427 miles (688 km) on internal fuel. (Hs 129B-1) Range 348 miles (560 km) on internal fuel. Weight: Empty equipped 8,400 lbs (3810 kg) with a maximum take-off weight of 11,574 lbs (5250 kg). Dimensions:Span 46 ft 7 in (14.20 m); length 31 ft 113/4 in (9.75 m); height 10 ft 8 in (3.25 m); wing area 312.16 sq ft (29.00 sq m). Armament:(B-1 Standard) Two 20 mm MG 151/20 cannon with 125 rounds per gun and two 7.92 mm (0.31 in) MG 17 machine guns with 500 rounds per gun. (B-2 Standard) Two 20 mm MG 151/20 cannon with 125 rounds per gun and two 13 mm (0.51 in) MG 131 machine-guns with 250 rounds per gun (although some aircraft retained the 7.92 mm (0.31 in) MG 17 machine guns). All the B Series aircraft were capable of using Rustsätze Kits which increased the aircraft's ordnance capacity. See the individual variants for specific information. Variants: Hs 129A-0, Hs 129B-0, Hs 129B Series, Hs 129B-2 Series, Hs 129B-2/Wa (Waffentrager), Hs 129B-3/Wa (Waffentrager), Hs 129C. Avionics: Revi C 12/C gunset. History:First flight (Hs 129V-1) early 1939, service delivery (Hs 129A-0) early 1941, first flight (Hs 129B) October 1941, service delivery (Hs 129B) late 1942. Operators: Germany (Luftwaffe), Hungary, Romania.